Intel announced that the new Google Clips* hands-free camera uses the Movidius™ Myriad™ 2 vision processing unit (VPU) for on-device artificial intelligence (AI) processing. 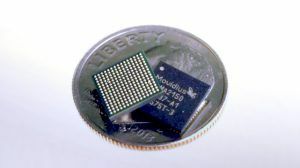 Google’s advanced machine learning algorithms run in real time directly on the Clips camera with the ultralow-power Movidius VPU inside. By enabling on-board processing, rather than in the cloud, Google is able to improve upon power consumption and latency and enable offline use.